If we don’t get a real fall or winter this year, maybe I can just draw fall and winter colors in my sketchbook? 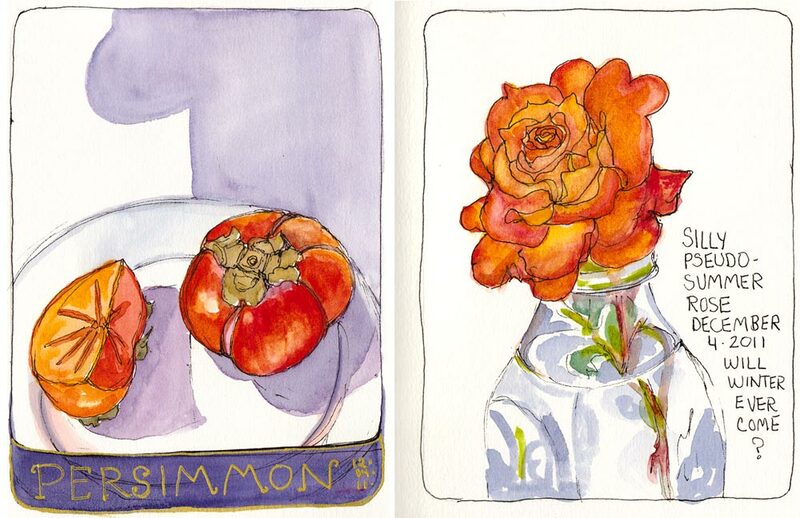 I got inspired by Apple-Pine’s persimmon sketching obsession to sketch (and eat) some persimmons of my own. Number One Persimmon, ink & watercolor, 7x5"
I really like the way this page turned out with the gold pen over the purple paint on the bottom that I originally added to correct a drawing/design problem, and the way the shadow (from something else on the table) kind of looks like a big number one. 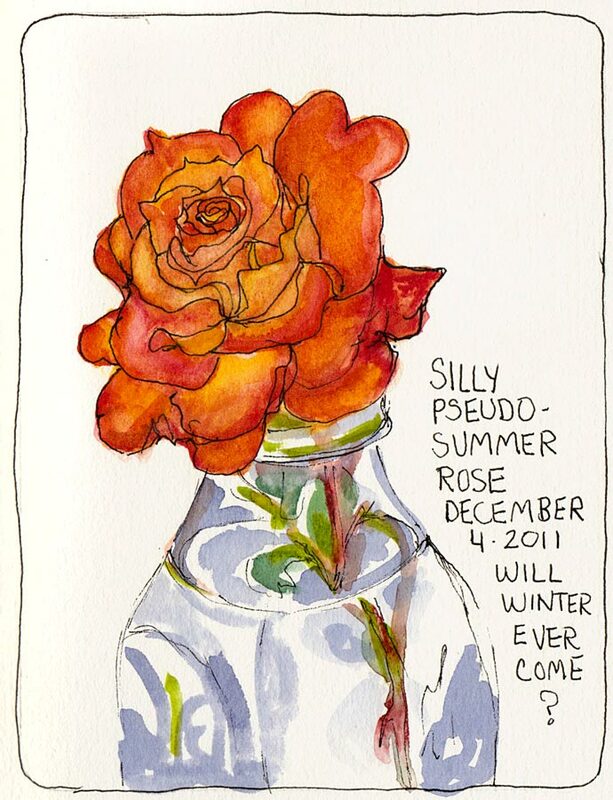 Silly Pseudo Summer Rose, ink & watercolor, 7x5"
It was over 70 degrees F today and my roses are so confused. Earlier this week we had a brief shower and a bit of cold but otherwise, it’s still not winter. I know: be careful what you wish for! 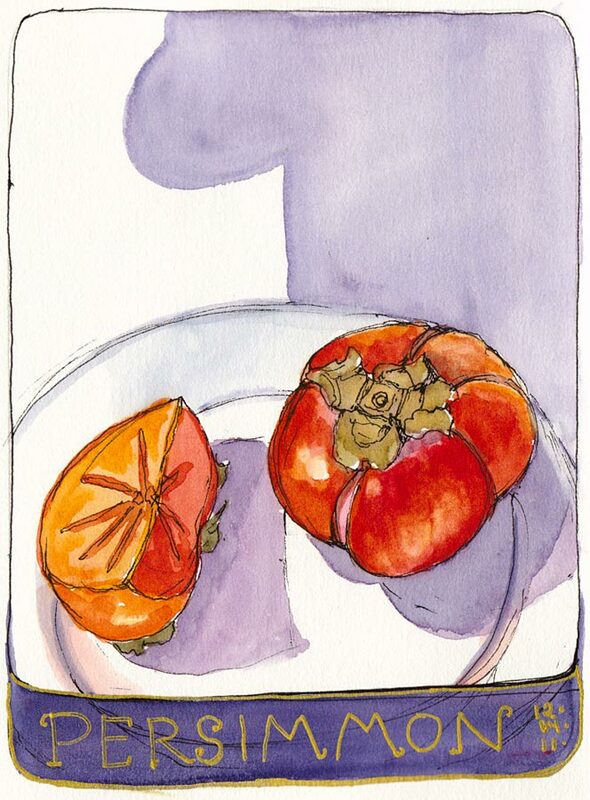 While was down in your area, our relatives served us a beautiful salad with persimmons that you might like to try: layer greens in a bowl, then slice peeled persimmons in a circle on top. Add a generous amount of pomegranate seeds and a handful of hazelnuts. Voila! A beautiful and festive salad for winter-or whenever. I like the way both sketches turned out!! I’ve seen persimmons around here (in stores) but don’t think I’ve ever eaten any. Maybe I’ll join the persimmon sketch challenge!